People don’t want to buy products. They want to hire products to get a job done. Or as Harvard Business School professor Theodore Levitt puts it: »People don’t want to buy a quarter-inch drill. They want a quarter-inch hole!«. People often do things because they find themselves with a problem they would like to solve — such as overcoming a boring commute, recovering from a stressful day or hanging framed photos on the wall. When people struggle they look out for solutions to achieve a progress in their lives. 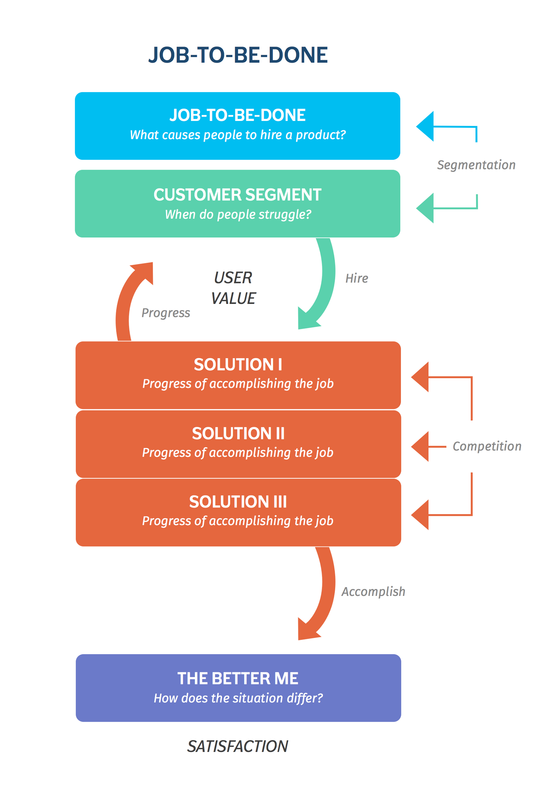 The Job-To-Be-Done framework has become popular in product design to uncover what causes people to hire products or services. Rather than understanding people by their demographic or socio-economic attributes, for instance income or level of education, the framework focuses on satisfying needs by understanding the jobs people want to get done. Uncovering these jobs makes it easier to build the right solutions. 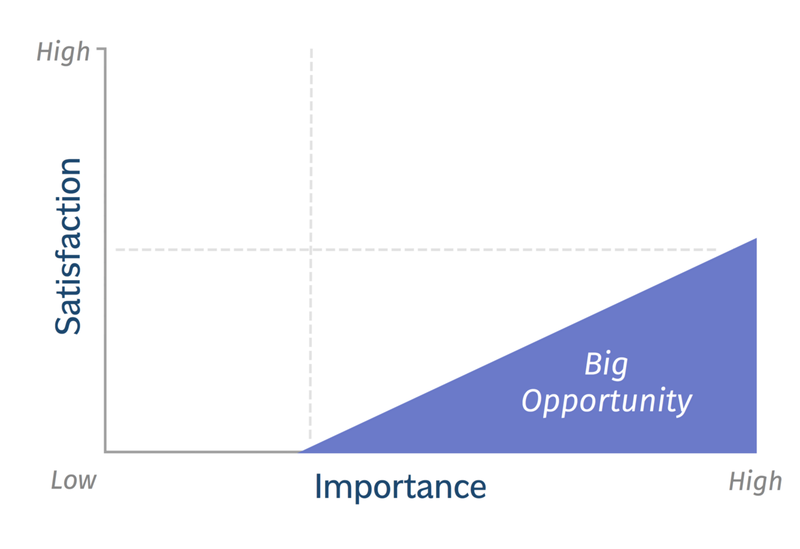 Identifying needs segments the market by jobs and, by doing so, defines the opportunity. Finding and improving the social, functional, and emotional dimensions of these jobs helps to design products that are precisely targeted at these jobs. People hire products to change something for the better, to move from where they struggle to a better situation. They don’t get active because everything is fine, but because something is wrong. To identify the true opportunity we need to find out if the job is worth solving it for a large number of people. If many people consider the job as important, but are not satisfied with current solutions, the opportunity grows. Identifying the Job opportunity – Is it worth to solve the job? Creating remarkable products does not come from understanding typical customers. Products must serve core needs, not what people say they want. We should think less about archetypal customers and more about the jobs people want to get done. Customers’ behavior must be observed rather than inquired. Instead of putting fictional Personas, based on common denominators, into the center of design research, we should focus on the jobs people hire the product for. Knowing these jobs helps to define the customer segment and to find a decent solution. 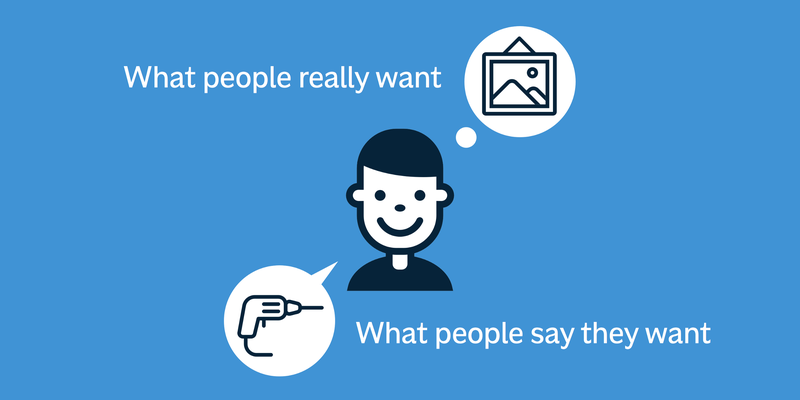 Creating Personas is a misleading concept. 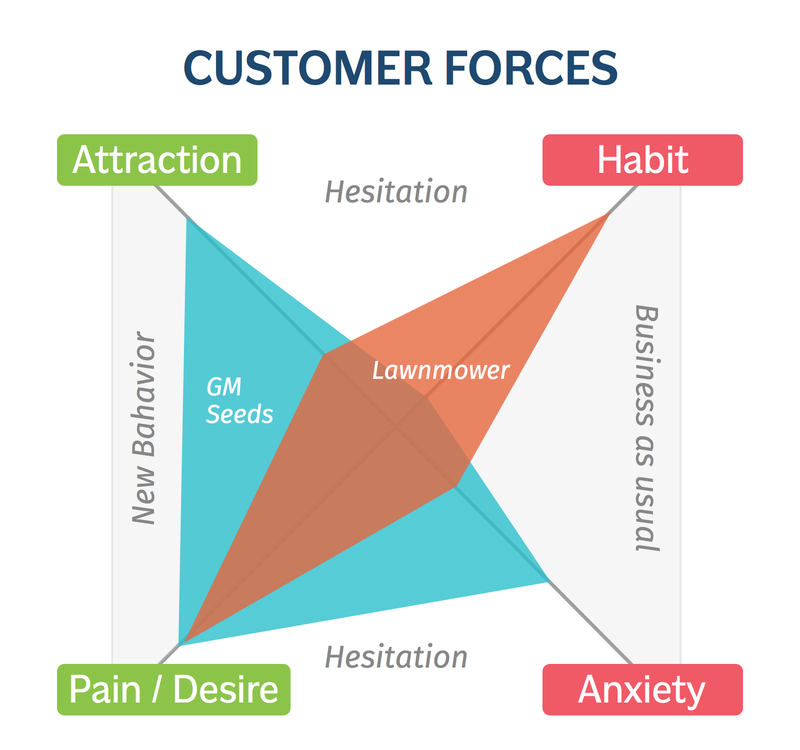 It leads to made-up customer segments build upon static, demographic attributes, and, thus, wrong product decisions. It does not tell you anything about situations people struggle with, needs they have, and jobs they want to get done. »Google was designed for the job of finding information, not for a search demographic« (Christensen, Cook & Hall). Instead of assuming needs, we need to learn from what people already do and understand what causes their behavior. We want to help people to accomplish their goals, not to feel comfortable in an environment adapted to their characteristics. Therefore, we need to understand the market and why people will use our product. The core job of a product is to help customers achieve progress. Therefore, our task is to make sure that people progress in accomplishing their job and change their situation for the better. Well-tailored solutions based on the job create better products and more satisfaction. Serving the customers desired outcome is crucial for a great user experience and the success of a product. We need to make sure the product focuses on getting the right job done the right way at the right time. And we need to do it better than anybody else. People don’t want a lawnmower, they want to keep the grass short and beautiful. Once a need emerges, people tend to look for the most convenient solution to get it done. They don’t care about the lawnmower. People only care if the solution serves their needs. When they can hire a better solution satisfying their needs more decently, like genetically modified seeds that never need to be cut, they probably fire the lawnmower. However, customers are not just hiring or firing products. They simply switch to something else, when it’s considered to be worth the time and effort of adopting new behaviors. To understand when and why people are willing to switch, we have to find out what triggers people to switch or to hire a new product. Identifying forces that keep people from switching or push people towards switching reveals the product’s chances of success in the competition. People switch to other products depending on expectations which solution can better fulfill the desired outcome, considering present habits, problems they have with the current solution as well as concerns about and attraction to the new product. Genetically modified (GM) seeds seem to be a better solution to keep the grass short and beautiful than a lawnmower would be. However, it will only succeed if people’s concerns about it can be removed. Getting a job done better means doing it easier, faster, and with higher output than every other solution. „Help me recover from stressful work“ covers various solutions like taking a vacation, drinks at the bar, sports or wellness. When we think of competition we tend to think of directly comparable use cases, but we probably might end up competing against other industries we’ve never thought about. »Email, for instance, is the biggest competitor to project management software. People hire email many times a day to keep their colleagues in the loop.« Uncovering products providing solutions for the same job our product does means exposing real competitors. Hence, beating the competitors requires providing the most convenient offer to get the job done. Don’t design products by asking power users what they want, but by observing what they actually do, when and where they struggle. Focus on understanding the job people want to get done and find out how the product fits into people’s lives. Sell the product’s outcome, not the product itself: Beautiful, cut grass — not lawnmower or GM seeds. Define UX strategies based on user data and design for core needs most people have and are not yet satisfied with in current solutions. By designing solutions around the job, products can have a real impact on people’s lives. Skip Personas and build decent solutions that help people make progress accomplishing their desired outcome through well crafted experiences. Creating value and satisfaction means changing people’s current situation for the better: People want to succeed. Let them make progress. Don’t stand in their way; remove every kind of distraction: Often you have to take features away in order to help customers making progress. Don’t care about direct competitors. Start thinking about alternatives for achieving the same job and do the job better than any other solution out there.